Palm trees in Islamorada, Florida. The Florida Keys is an archipelago of about 1700 islands in the southeast United States. 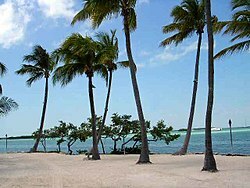 They begin at the southeastern tip of the Florida peninsula, about 15 miles south of Miami, and extend in a gentle arc south-southwest and then westward to Key West, the westernmost of the inhabited islands, and on to the uninhabited Dry Tortugas. The islands lie along the Florida Straits, dividing the Atlantic Ocean to the east from the Gulf of Mexico to the west, and defining one edge of Florida Bay. At the nearest point, the southern tip of Key West is just 98 miles (157 km) from Cuba. The Florida Keys are between about 23.5 and 25.5 degrees North latitude, in the subtropics. The climate of the Keys however, is defined as tropical according to Köppen climate classification. More than 95 percent of the land area is in Monroe County, but a small portion extends northeast into Miami-Dade County, primarily in the city of Islandia, Florida. The total land area is 355.6 km² (137.3 sq mi). As of the 2000 census the population was 79,535, with an average density of 223.66/km² (579.27/sq mi), although much of the population is concentrated in a few areas of much higher density, such as the city of Key West, which has 32% of the entire population of the Keys. This page was last changed on 8 November 2014, at 17:22.